Two years ago, if you asked me “Would you ever get Botox?”, I would’ve said no. My idea of Botox was the mom from A Cinderella Story when she says “I’m very very upset!” and her face literally doesn’t move hahaha. However, over the past two years I’ve dove deep into the medical skincare world and all it has to offer from products to plastics. Public opinion of injectables is very much a negative connotation yet our society condemns wrinkles like it’s the plague. It’s like we’re supposed to have this porcelain skin but it has to be natural or it’s no good. An unrealistic beauty standard- big surprise there. For me, using Botox was essentially the same as coloring my hair. It’s a semi-permanent change I’m making to my appearance to look the way I want! You only have to watch a few of my instagram stories to see that I have a very expressive face. When I say that, I don’t mean I have a lot of emotions, I mean that the muscles on my face have a wide range of movement, thus pulling my skin along with them. In order for that to happen, wrinkles have to happen. Not everyone is like this, which is why wrinkles started showing up on me in my mid-twenties and no amount of hydration, cream or sunscreen was going to fix that. So I started talking to the lovely gals at Bare Med about Botox. I want this to be known- I asked THEM about it. Never once did I feel pressured or uneducated. I quickly learned that girls my age were taking this as a preventative measure now, as opposed to a reversal measure later. Essentially, I was stopping the wrinkles from forming, instead of trying to undo them- much easier & takes much less Botox. Preventative Botox is used to retrain facial muscles and essentially improve facial posture. It specifically targets “dynamic” muscle movements aka the ones that cause wrinkles! I think the before and afters speak for themselves! My eyebrows still move and my face looks no different, except for the wrinkles! I asked you guys questions you had for the nurse injector and about my experience- here are her answers. $13.50 a unit (at Bare Med). 2. How do you know how much to get? 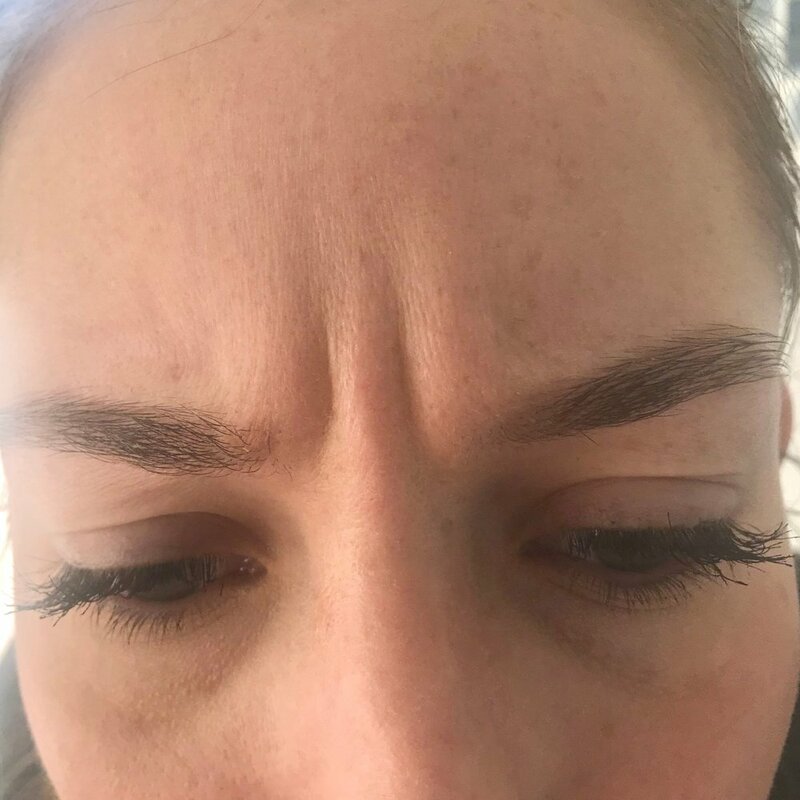 The nurse injector discusses this with you and the two of you make a decision based on where the wrinkle is and how deep it is. I treated my forehead and 11s with 25 units. This will vary for each person and for each particular part of the face! 3. What did it feel like? My pain tolerance is LOW. Like very low. As in hand sanitizer on a paper cut will bring me to my knees. On a scale of 1-10, if 10 were the bear attack on The Revenant, I’d rank the whole thing at a 2. The closest I can compare it to was plucking your eyebrows, but not the deep hairs that make your eyes water. Just the little ones. You definitely felt it, but I’m not even sure if the word “hurt” is how I would describe it. It was very east and fast. The effects start to wear off around 3-4 months. This doesn’t mean that the effects are gone at 3-4 months, just that it starts to get metabolized by the body. Obviously injectables are not something you should do on a whim. Like I said, it is semi-permanent and should be discussed with your nurse injector before proceeding. I strongly recommend Bare Med Spa if you’re local to the KC area. I felt very safe and educated, which is super important for starting Botox! If you want more info, you can call Bare Med Spa at the downtown location at 816-844-9334 or at the Leawood location at 816-491-4000. Check them out online at www.baremed.com. I linked a map of the downtown location below! As always, never hesitate to reach out to me if you have questions!